This colorful mix of dark red, purple, rosy pink, yellow, fuchsia, blue-purple, orange and other colors is sure be a star in the sunny garden and borders. 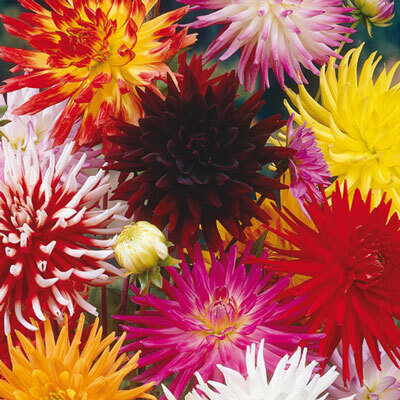 Growing 24-48" tall, the Cactus Dahlia Mixed adds drama to the garden with its showy, starburst-type flowers. The fully double, spiky flowers are long-lasting and make good cut flowers. They bloom from midsummer to frost. 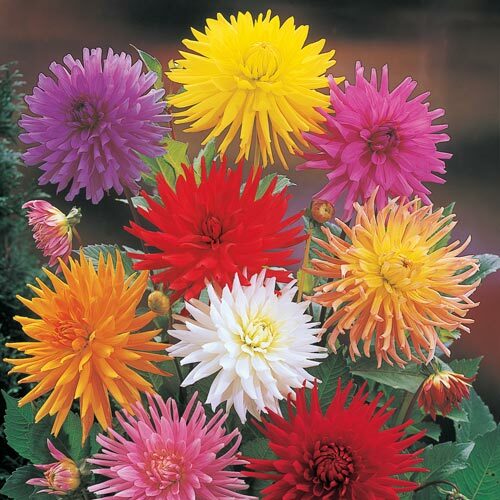 Like other cactus dahlias, the Cactus Dahlia Mixed is easy to grow and deer resistant. Petals are narrow and pointed.